on their way back, revived the old Justice Society of America — but because Justice "Society" sounded a bit hoity-toity to him, he gave it a slightly different name, The Justice League of America. He gathered together nearly all of DC's then-extant superheroes (Aquaman, Batman, The Flash, Green Lantern, The Martian Manhunter, Superman, and Wonder Woman — somehow, he overlooked Green Arrow, but made him the first addition to the group) and teamed them up to fight an alien menace named Starro the Conqueror. This occured in the March, 1960 issue of The Brave & the Bold, a comic book title which then functioned as a try-out arena, where concepts that had not yet proven themselves were tested before receiving their own series. It was a successful trial. The Justice League of America title went into regular publication only four months after winding up its three-issue test run. That series was to last over a quarter of a century. Before long, Schwartz introduced revamped versions of two more 1940s characters, The Atom and Hawkman, and added them to the mix. That completed what fans generally consider the "classic" JLA, although quite a few other costumed do-gooders, including The Elongated Man, The Black Canary, Firestorm, The Red Tornado, Zatanna, and even The Phantom Stranger, became members later on. By 1963, many of the old 1940s characters had been brought back in their original forms, at least for cameo appearances. Writer Gardner Fox, who, two years earlier, had begun the process of re-introducing them, brought the whole crowd together that year for the first of what would become an annual team-up of the Justice League and Justice Society. The story was spread out over two issues (titled "Crisis on Earth-One" and "Crisis on Earth-Two"), both of which have since become highly prized collector's items. Until fairly recently, The Justice League of America was never animated as such except as occasional back segments on Aquaman's 1968 TV show. However, a version of it entitled Super Friends had several incarnations on Saturday morning TV, starting in 1973. 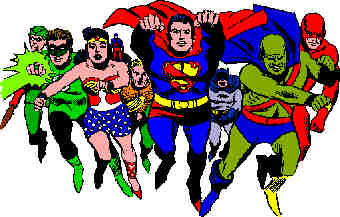 All through the 1960s and '70s, the JLA series functioned as a meeting ground for DC's super characters. But in the '80s, a downturn in circulation led DC's decision makers to think it might be growing stale. In an apparently desperate attempt to juice it up, they made an unfortunate decision to jettison the traditional characters and pack it with a bunch of ethnically-diverse unknowns — perhaps the worst of which was a Puerto Rican super-breakdancer named Vibe. Sales plummetted, and the group disbanded — meaning the comic was cancelled — in 1987. Later that year, a new Justice League was formed, without "America" in the title. Since then, there have been several spin-offs and revivals, with varying degrees of success — including a couple of animated TV series, starting in 2001. But however enjoyable these may be to modern-day readers, the JLA of old is gone.